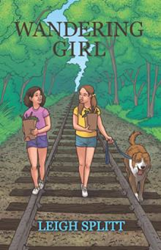 “Wandering Girl” (published by Archway Publishing), a new children’s book by Leigh Splitt, follows the journey of a Girl Scout who learns that adventures always come with challenges during the summer of 1970. The book is available on numerous bookstore websites, including Amazon and Barnes & Noble, as well as the “Wandering Girl” website at: http://www.leighsplittauthor.com/buy/. Linda McCollough loves to play in her Wisconsin neighborhood, where she rides her bike, hangs out with her Brownie Scout troop, climbs the iron bars at the park, and teases her teenage babysitter. One day in June, she meets YMCA championship swimmer Peggy Bryant. Soon the 9-year-old girls discover that they are both seeking the same things in life: freedom and adventure. When their activities get them into trouble, Linda develops a secret plan for the friends and Peggy’s dog to run away-deep into the forbidden woods along the railroad tracks. There, they encounter hoboes – WWII veterans – who teach them what it really means to just wander through life. Leigh Splitt is a model, actress and writer. She graduated from West High School in Appleton, Wisconsin, and Drake University in Des Moines, Iowa, with a Bachelor of Arts in news-editorial journalism and mass communications. Splitt has traveled through 49 states and 25 countries. She and her husband, David White, live in Grand Chute, Wisconsin.